NUsolutions for EFI® is a range of NUtec-designed auxiliary components allowing easy access to EFI® VUTEk printers without the need to use the original packaging form. The components consist of connector stems for CMYK and White and a bottle specially designed for the VUTEk printers. NUsolutions for HP-FB is a range of NUtec-designed auxiliary components allowing easy access to HP® FB™ printers without the need to use the existing OEM ink configuration. These components consist of specially designed adaptor caps and positioning plates, which offer the flexibility of choosing from any of the standard 2.5L or 1.7L NUtec UV ink products, suitable for rigid as well as roll to roll applications. 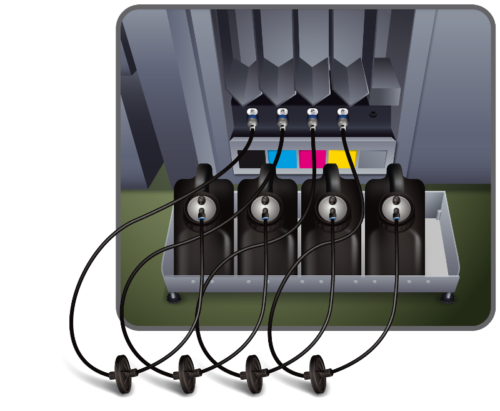 NUsolutions NUbis is a unique proprietary Bulk Ink System engineered to ensure a continuous supply of ink to the Epson® DX™4, DX5, DX6 and DX7 print heads. It allows more efficient printing with uninterrupted refilling, giving the functionality of a cartridge but with the advantages of a bulk system. 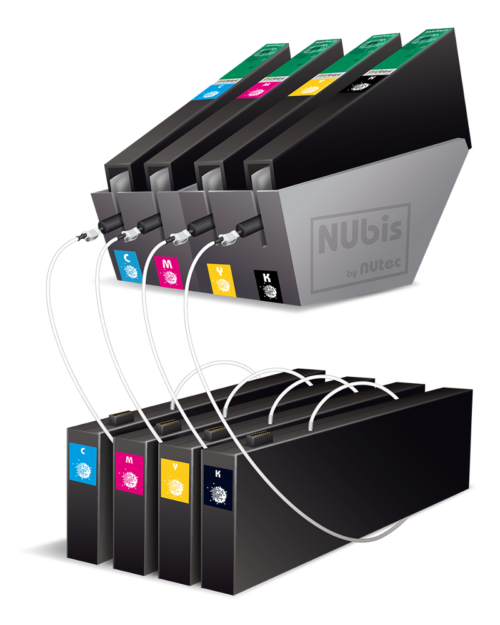 The NUbis system holds degassed pouches in multiples of 2, which are easy to replace when empty, even during printing without disrupting the print session. Degassed pouches are generally more efficient especially when printing at high speeds and as such are more reliable than any conventional open bulk ink system. Replacing pouches can be done quickly and cleanly: The system connecter needles attaches easily to the nozzle of the pouch for a fast, spill-free refilling process, reducing ink wastage. NUsolutions for Océ & Fuji is a range of NUtec-designed auxiliary components allowing easy access to Océ® Arizona and Fujifilm® Acuity printers without the need to use the original packaging form. 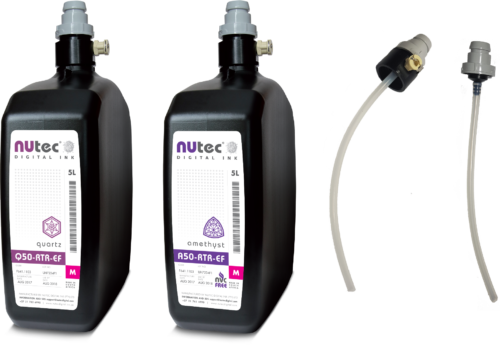 The components consist of adapter caps and stems with a low level shut off valve, which offer the flexibility of choosing from any of the standard 2L NUtec UV ink products, suitable for rigid as well as roll-to-roll applications.